Heavy/Scratch: Give Drift A Waist! Discussion in 'Radicons Customs' started by autobotx23, Aug 22, 2010. You want to start by taking all the limbs off. After that, using a razor saw or a jeweler's saw, cut the section between the upper and lower torso. You can use a dremel, but you may loose a lot of the plastic while cutting. Using a jeweler's or razor saw give you a much cleaner cut. Here you see the bottom of the upper half (the blue plastic is the bottom of the LED power supply in place). 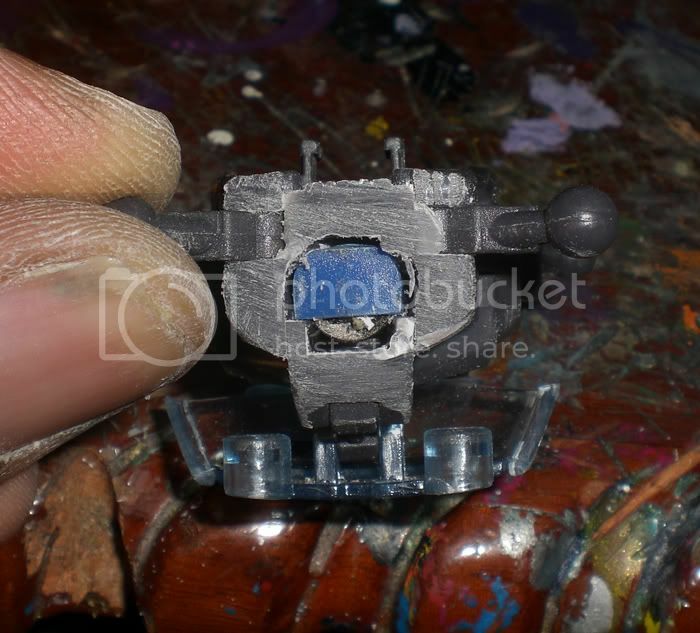 Dremel in a hole in the top of the lower half for your socket and attach the ball joint/peg to the top half. Voila! Drift has a waist! Guys, if you have any comments or questions, now's the time to ask them. Dude!!! Thanks AutobotX23! What a great and speedy (38 minutes by the time stamps) answer to my question about how you did this on your Substitute Shinigami Autobot:Kurosaki Ichigo custom. I thought since you showed how you did yours I'd snap a couple of pics of how I plan to do mine. (Refer to attached pics) Like I said in the other thread, I have a bunch of extra Gundam joints and figured that I could cut my Drift's torso in half like you explained. 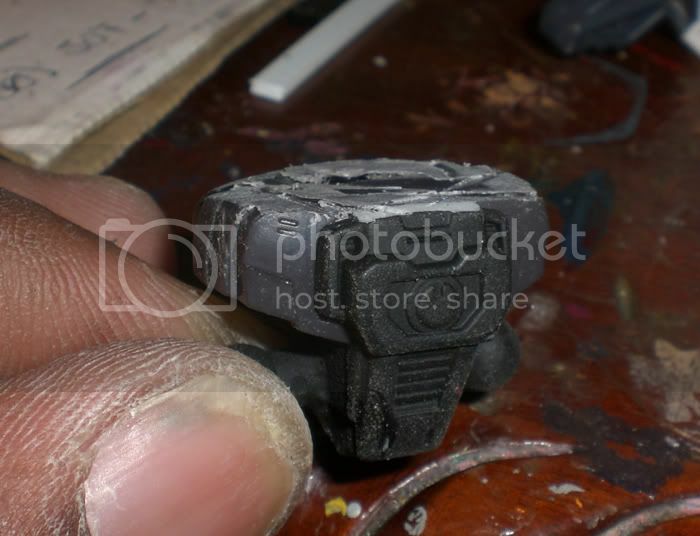 Then I could create a spot for the joint to go into in top or bottom half with green stuff and/or styrene and affix a rod (maybe a piece of model tree or something) to the other half to be the "male" end of the connection. I just need the nerves (I really don't want to mess this guy up, although my target is having a sale now on ALL Deluxes for $9.49 so I'm not too worried) and a razor saw to make this happen. What do you suggest for a good razor saw BTW? I keep seeing this one at Hobby Lobby but am not sure it's the best. I haven't checked our Hobbytown to see what they have for saws yet though so they might have better ones. Thanks again for the peek into your mod. Drift totally approves of this. Hey Ryan, check out this link: Hobby Knife & Miter Saw Craft Set : Target. It looks like a great deal and it has most of the tools needed for something like this (and other mods/builds). For something like Drift's waist, I think you'd need more of a jeweler's saw or a saw like the one in my link above. As Earl mentioned, if you use a dremel, you risk losing a bit of plastic also. If you use the tool in your link, it could work, but you'd need to apply more pressure, but if you use a saw-edged blade, you can saw through the plastic much easier. And Earl, excellent mods! Definitely need to give this a go on my Drift sometime soon. Thanks Brian! That's a pretty sweet little set. I'll have to look into that. Is that a leather strop in there too? I'm totally getting this now. BTW I've been working on my Jazz and will probably post pics soon. Thanks again for the advise. Anytime, my friend! (you got he "i" and the "a" mixed up a bit--lol, it's all good though). Let me know if you have any questions on the Jazz stuff. Can't wait to see it. As for that tool set, I need to pick one of those up myself (apparently, it's online only though). Considering how your fingers look in the picture, i think i'll stick to my Dremel. It doesn't cause that much damage! And, nice tutorial, btw. What joint did you use (not that it really matters, but i thought i'd ask anyways)? Cool stuff! Now if I ever see a frikkin' Drift in Calgary, I'll totally do this! Holy crap dude, your fingers are dead. Thanks for the tutorial, will be very useful for a couple of kitbashes i've got planned. Actually they were covered in styrene dust in these pics...but my hands are pretty jacked. My girl says I have man hands. man hands are better than dainty ones... on a man anyways... nice tutorial! I wasn't even talking so much about the white lines as i was talking about the fact that the tips of your fingers look like expired tuna. Styrene dust isn't excactly the safest thing either though. Yeah, they are pretty jacked up. No loss of sensation or feeling through. Just super callused. Sweet...I'll be dropping mine off soon! So would it be possible to do this by cutting above the piece that holds the scabbards as well? And is the roof/windshield attached to that piece? Cause i'm looking for a way that will allow me to move the roof onto the back during transformation. It should be. I was looking at my Drift last night and figured it shouldn't be too unreasonable to double-cut that section into somewhat of a belt/midriff section that would allow the windshield to be rotated onto the back. Might be useful for folks wanting a Deadlock figure. Door kibble's attached to that section though, and it gets a bit awkward to handle in reverse. Miss me living next door, huh? I'm sure you could, but above the two scabbards/doors is where the chest separates in half. It may get a lil dodgy making sure they line up okay. But If anyone can get it to work you can man. I'll be taking pics of the bonus items for Ichigo tomm. I'll snap a few just for you. It effects transformation in NO WAY, that's if you do it properly. The upper and lower torso still need to be flush with each other after the ball joint is installed.